The premise of When We Grow Up strongly incorporates the multiverse theory. Very literally, it is about a parallel dimension in which children are forced to choose their career at a young age. The multiverse is essentially a device to justify our show so I’ve had to research the multiverse theory to prep for this show. So what is the multiverse theory? Well, it’s frequently regarded as a scientific possibility. Perhaps something that could potentially be proven. Infinite unseen worlds comprised of things different from ours. In thinking about other slightly different universes that are unseen, it seems obvious to me that the multiverse theory is not based on science but rather philosophy. The multiverse theory is a thought experiment much like the Ship of Theseus or the trolley problem. In my research I had to boil the multiverse theory down to its essential question. What is it asking? What were the people that created the theory of the multiverse asking? For those of you who don’t know, this theory allows for a different universe for every single different choice or different way things could be. So if you make a choice about what to major in during college, there are different universes for every possible major. Additionally, there are different universes for every cosmic possibility. What if the sun had a diameter twice the size of its current size? Naturally, there is a universe for that and in that universe, our sun might not be able to sustain our solar system and Earth wouldn’t exist. If you extrapolate, there are an infinite number of universes for each of the infinite possibilities of the ways things could be. So I came to the realization that the multiverse theory is asking, “What if things were different?” “What if I made that other choice?” It comes down to wondering if our actions have consequences. A similar conclusion Hamlet might have come to wondering if the universe in which he killed Claudius was better than the one in which he acknowledged that an evil demon was trying to deceive him. Ultimately, this was a mind-blowing thing to realize. The essential question for the multiverse theory is the same essential question we’ve used for the show: What if? What if I didn’t make that choice? How do I know what I do is right? We at Critical Point want audience members to come to When We Grow Up and be forced to think about actions and consequences. We want the audience to enter our world of smoke and mirrors and come out more able to answer that one important question: What if? 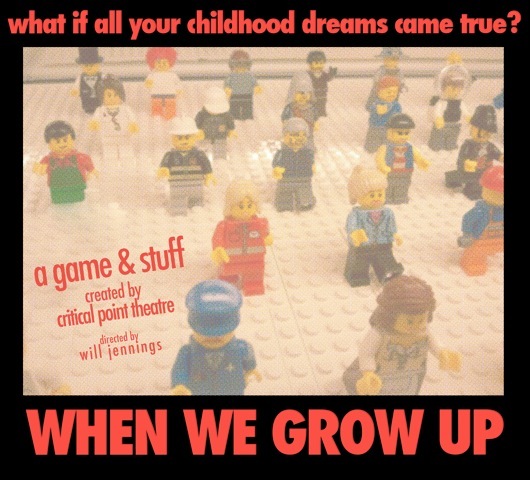 Please consider donating to Critical Point Theatre’s IndieGoGo campaign here. Being a new, independent theatre company makes it almost impossible to collect large grants so we rely on donations from crowdfunding campaigns and fundraisers. We would really appreciate visiting that page to learn more about When We Grow Up and potentially donating or sharing the link on your Facebook page. Pingback: What Happens When We Sleep? ← What is WHEN WE GROW UP?